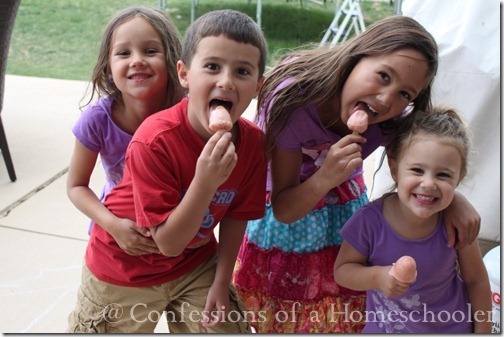 Welcome to my Summer Boredom Busters activities for kids! For July I thought it would be fun to post some ideas to keep your kiddos happy and whining to a minimum! Today, I have a fun variation to our daily smoothie recipes…freeze them! That’s right, I just made our regular smoothie recipe and added a little extra orange juice to them to make them into yummy and healthy summer popsicles! 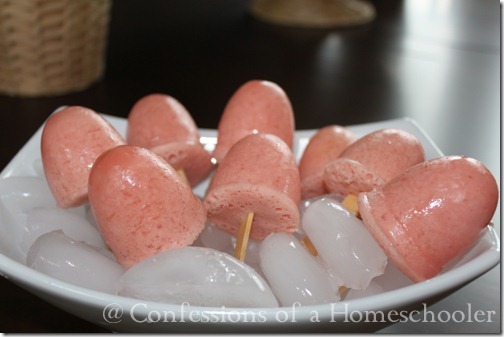 The above Popsicle were done in a Popsicle mold I found in the $1 section at Target. 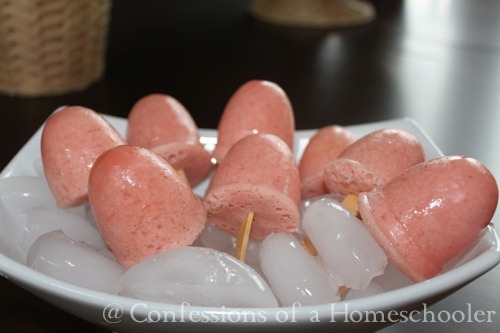 These popsicles were made in a cake-pop silicone mold using our strawberry banana smoothies. Add all ingredients into a blender and mix until smooth. Pour into whatever popsicle molds you have, we found ours at the dollar bin in Target. You can also use fun shaped metal containers, and even silicone cake pop molds! This usually serves my 4 kiddos and me, but they all get half glasses. If I need a little more, I’ll just add in some more milk or juice. It makes the smoothie a bit runny, but no one seems to mind and it’s cheaper that way! The best part about these is that you know they’re healthy, and the kiddos love them. What a great summer treat for all these hot days we’ve been having! And yes, Tinker Bell had one, she just ate it before I could get the picture crazy kid. NO dessert is safe around her. Seriously. I put fresh spinach in mine when I blend it and then freeze them in molds and they love it. Adds so much nutrition. Your kids look like they really enjoy these. Can’t wait to try them with our kids. I like the suggestion of using fresh spinach in them. These look tasty! Thanks for the great ideas. I had noticed recently that you have a “prayer wall” in your homeschool room. We have been using our fridge, but I like your idea much better. Thanks! I am just lifting everything from your blog! I love it all! Thank you, thank you for all of your wonderful posts – this is truly a homeschool sanity lifesaver!!! 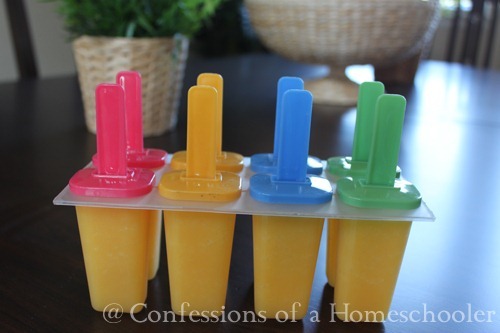 Smoothie Popsicles, what a great idea! I’ve made tea and juice ice cubes to use in my smoothies, but never the other way around. Going to try this soon. Thanks for the idea. Love these Popsicles! Kids and hubby thought they were great. A healthy treat for the hot summer months.